In 2002 the United States Kidney Foundation launched a novel framework for defining and classifying chronic kidney disease.1 The framework was widely embraced because it imposed order in a chaotic landscape characterised by a variety of names, including renal insufficiency, renal impairment, and renal failure. It has had an appreciable effect on clinical care worldwide through guidelines,2 pay for performance measures,3 and sparked debate on the merits of screening programmes.4 However, it has also generated considerable controversy.5 6 7 We examine the rationale for the framework, the varying responses and controversies it has provoked, and provide advice for clinicians who are being faced with an increasing number of people categorised as having chronic kidney disease. Two centuries ago Bright’s description of the associations between kidney disease and albumin in the urine of patients with dropsy was hailed as one of the first practical modern aids to diagnosis. Starting with Homer Smith in the 1930s, estimates of “renal clearance” emerged as measures of kidney function, leading most recently to the development of equations using various serum biomarkers, such as creatinine or cystatin C, for estimating the glomerular filtration rate (GFR). One organisation has made substantial modifications to the framework. Kaiser Permanente in Southern California has adapted the framework using a formula to take age into account,20 reducing the prevalence of chronic kidney disease in its insured population to about 3% compared with the almost 14% estimate arising from the framework definition. Although early detection might benefit some people, by labelling so many people at low risk of symptoms as having chronic kidney disease, the new definition axiomatically produces overdiagnosis: “like a fishing trawler it captures many more innocent subjects than it should.”26 The current definitions may misclassify at least 30% of elderly people as having stage 3 disease,18 with those classified as stage 3A without albuminuria at highest risk of overdiagnosis. It is not clear that the current markers of early renal dysfunction, either eGFR or microalbuminuria, are useful in identifying those patients who are at most risk of symptomatic renal disease. Further research is needed to better identify which patients are at greatest risk of a modifiable form of chronic kidney disease that without intervention would progress to symptomatic advanced disease. Until better methods are available, we suggest that clinicians consider the age of the patient and the trajectory of eGFR or urinary albumin test results, and acknowledge to patients that at the moment it is uncertain whether mildly reduced renal function in the absence of other risk factors should be treated or not (box). If a patient is found to have reduced renal function on a single test, the current guidance to confirm the result with another test soon after the first and that another test should be conducted after three months, should be followed. Look for other changes that support the diagnosis—for example, is there evidence of anaemia, abnormal urinalysis results, or abnormalities on renal ultrasonography? The benefits, harms, and costs of testing, monitoring, and treating the increased number of people being identified as having chronic kidney disease need to be established by prospective studies. Meanwhile the risk of overdiagnosis warrants greater professional scrutiny and more public awareness. Clinicians should be careful not to apply disease labels to the many older people whose eGFR falls within the definition of chronic kidney disease but who are at very low risk of developing clinical problems. The fact that Kaiser Permanente explicitly attempted to avoid labelling “low risk elderly” people and adopted a higher threshold reinforces the argument for reviewing the 2012 framework. A review should be conducted by a panel with broad representation from specialty and primary care, population health, patient organisations, and civil society with minimal conflicts of interest. It is in everyone’s interest to find the best way to maximise prevention of kidney disease and its consequences while minimising the risks and cost of overdiagnosis. This article is part of a series on overdiagnosis looking at the risks and harms to patients of expanding definitions of disease and increasing use of new diagnostic technologies. Contributors and sources: RM is a writer and is currently doing a PhD on overdiagnosis, for which chronic kidney disease is a case study. RJG is a retired academic nephrologist who has written extensively about the pitfalls of diagnosing CKD. JD is a clinical epidemiologist and practising general practitioner. Competing interests: We have read and understood the BMJ Group policy on declaration of interests and declare the following interests. JD and RM have received support from an NHMRC STEP grant, and are helping to organise the preventing overdiagnosis conference, supported by BMJ and Consumer Reports. RM has been advising on the BMJ Too Much Medicine series. RJG provides consultation to a number of pharmaceutical companies, none directly involved in providing care for end stage renal disease. He is a medical adviser to American Renal Associates, a US provider of dialysis. He also receives honorariums for engaging in educational activities for the American Society of Nephrology and UpToDate (a Wolters-Klewer Company). National Kidney Foundation. K/DOQI clinical practice guidelines for chronic kidney disease: evaluation, classification and stratification. Executive summary. Am J Kidney Dis2002;39:S17-31. National Institute for Health and Care Excellence. Chronic kidney disease: early identification and management of chronic kidney disease in adults in primary and secondary care. http://guidance.nice.org.uk/CG73. National Institute for Health and Care Excellence. About the Quality and Outcomes Framework. www.nice.org.uk/aboutnice/qof/qof.jsp. Moyer V. Screening for chronic kidney disease. US Preventive Services Task Force recommendation statement. Ann Intern Med2012;157:567-70. Wetzels JFM, Kiemeney LA, Swinkels DW, Willems HL, den Heijer M. Age- and gender-specific reference values of estimated GFR in caucasians: the Nijmegen Biomedical Study. Kidney Int2007;72:632-7. Winearls CG, Haynes R, Glassock R. CKD staging—evolution not revolution. Nefrologia2010;30:493-500. Eriksen BO, Ingebretsen OC. In chronic kidney disease staging the use of the chronicity criterion affects prognosis and the rate of progression. Kidney Int2007;72:1242-8. Hoy WE, Mathews JD, McCredie D, Pugsley DJ, Hayhurst BG, Rees M, et al. The multidimensional nature of renal disease: rates and associations of albuminuria in an Australian Aboriginal community. Kidney Int1998;54:1296-304. Hallan SI. Matsushita K, Sang Y, Mahmoodi B, Black C, et al. Age and association of kidney measures with mortality and end-stage renal disease. JAMA2012;308:2349-60. Levey AS, de Jong PE, Coresh J, El Nahas M, Astor BC, Matsushita K, et al. The definition, classification, and prognosis of chronic kidney disease: a KDIGO controversies conference report. Kidney Int2011;80:17-28. Matsushita K, van der Velde M, Astor BC, Woodward M, Levey AS, de Jong PE, et al. Association of estimated glomerular filtration rate and albuminuria with all-cause and cardiovascular mortality in general population cohorts: a collaborative meta-analysis. Lancet2010;375:2073-81. National Kidney Foundation/KDIGO guideline for CKD classification and management. 2012. www.kdigo.org/clinical_practice_guidelines/CKD.php. National Kidney Foundation. Kidney disease outcomes and quality initiative guidelines. Part 12. Acknowledgements. 2002. www.kidney.org/professionals/kdoqi/guidelines_ckd/p12_ack.htm. Levey AS, Coresh J. Chronic kidney disease. Lancet2012;379:165-80. Chadban SJ, Briganti EM, Kerr PG, Dunstan DW, Welborn TA, Zimmet PZ, Atkins RC. 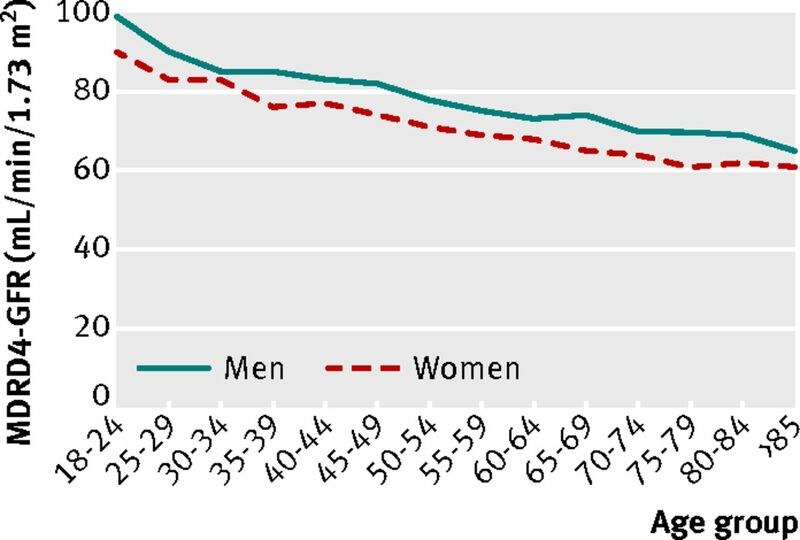 Prevalence of kidney damage in Australian adults: the AusDiab kidney study. J Am Soc Nephrol2003;14(suppl 2):S131-8. Nissenson AR, Pereira BJG, Collins AJ, Steinberg EP. Prevalence and characteristics of individuals with chronic kidney disease in a large health maintenance organization. Am J Kidney Dis2001;37:1177-83. Glassock RJ, Winearls C. An epidemic of chronic kidney disease: fact or fiction? Nephrol Dial Transplant2008;23:1117-21. Chronic kidney disease: management in general practice. 2nd ed. Kidney Health Australia, 2012. Rutkowski M, Mann W, Derose S, Selevan D, Pascual N, Diesto J, et al. Implementing KDOQI CKD definition and staging guidelines in southern California Kaiser Permanente. Am J Kidney Dis2009;53(suppl 3):S86-99. Schaeffner ES, Ebert N, Delanaye P, Frei U, Gaedeke J, Jakob O, et al. Two novel equations to estimate kidney function in persons aged 70 years or older. Ann Intern Med2012;157:471-81. National Kidney Foundation. About chronic kidney disease. 2012 www.kidney.org/kidneydisease/aboutckd.cfm. Hallan SI, Dahl K, Oien CM, Grootendorst DC, Aasberg A, Holmen J, Dekker FW. Screening strategies for chronic kidney disease in the general population: follow-up of cross sectional health survey BMJ2006;333:1047. Spence D. Bad medicine: chronic kidney disease BMJ2010;340:c3188. Fink HA, Ishani A, Taylor BC, Greer NL, MacDonald R, Rossini D, et al. Chronic kidney disease stages 1-3: screening, monitoring, and treatment. Comparative effectiveness reviews No 37. 2012. www.ncbi.nlm.nih.gov/books/NBK84564/. Winearls CG, Glassock RJ. Classification of chronic kidney disease in the elderly: pitfalls and errors. Nephron Clin Pract2011;119(suppl 1):c2-4. Crinson I, Gallagher H, ThomasN, de Lusignan, S. How ready is general practice to improve quality in chronic kidney disease? A diagnostic analysis. Br J Gen Pract2010;60:403-9. National Kidney Foundation. Chronic kidney disease. www.kidney.org.uk/Medical-Info/ckd-info/index.html. De Boer IH. Chronic kidney disease—a challenge for all ages. JAMA2012;308:1-2. Richard Lehman’s journal review. BMJ blog, 17 December, 2012. http://blogs.bmj.com/bmj/2012/12/17/richard-lehmans-journal-review-17-december-2012/. O’Hare A. Measures to define chronic kidney disease. JAMA2013;309:1343. Parikh NI, Hwang S, Larson MG, Levy D, Fox C. Chronic kidney disease as a predictor of cardiovascular disease (from the Framingham Heart Study) Am J Cardiol2008;102:47-53. Drawz PE, Baraniuk S, Davis BR, Brown CD, Colon PJ, Cujyet AB, et al. Cardiovascular risk assessment: addition of CKD and race to the Framingham equation. Am Heart J2012;164:925-31.e2. Weiner DE, Tighiouart H, Griffith JL, Elsayed E, Levey A, Salem DN, et al. Kidney disease, Framingham risk scores, and cardiac and mortality outcomes. Am J Med2007;120:552.e1-8. Glassock RJ. Is the presence of microalbuminuria a relevant marker of kidney disease? Curr Hypertens Rep2010;12:364-8. Coresh J, Astor BC, Greene T, Eknoyan G, Levey AS. Prevalence of chronic kidney disease and decreased kidney function in the adult US population: Third national health and nutrition examination survey. Am J Kidney Dis2003;41:1-12. Samal L, Liner J. 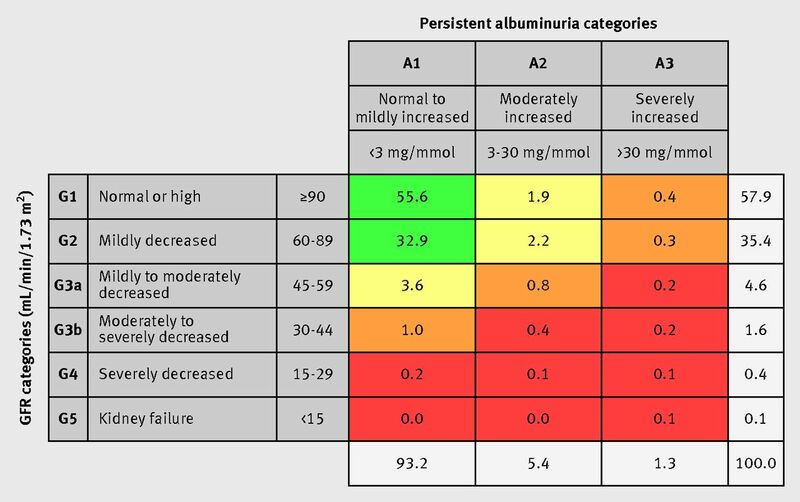 The primary care perspective on routine urine dipstick screening to identify patients with albuminuria. Clin J Am Soc Nephrol2013;8:131-5. Pickering T. Now we are sick: labeling and hypertension. J Clin Hypertens2006;8:57-60. Phillips, LA, Donovan KL, Phillips AO. Renal quality outcomes framework and eGFR: impact on secondary care Q J Med2009;102:415. Noble E, Johnson DW, Gray N, Hollett P, Hawley CM, Campbell SB, et al. The impact of automated eGFR reporting and education on nephrology service referrals. Nephrol Dial Transplant2008;23:3845-50. Den Hartog JR, Reese PP, Cizman B, Feldman HI. The costs and benefits of automatic estimated glomerular filtration rate reporting. Clin J Am Soc Nephrol2009;4:419-27.